Facilities: FCI Ray Brook with a detention center. 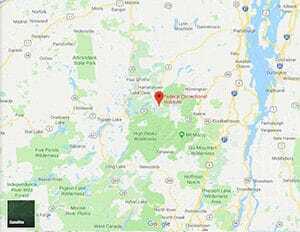 Location: FCI Ray Brook is located in upstate New York, midway between the villages of Lake Placid and Saranac Lake, off Route 86. Background: FCI Ray Brook was opened in 1981. The site was formerly the Olympic Village for the 1980 Winter Olympic Games. The Bureau of Prisons has received numerous complaints regarding conditions at FCI Ray Brook. The United States Court of Appeals for the Second Circuit reinstated a previously dismissed lawsuit filed against the Bureau of Prisons on behalf of six inmates who were allegedly housed in an extremely hot and cramped single room without adequate ventilation and cleaning supplies. The lawsuit is currently pending. Housing: Inmates are housed in two and four-person cells. Health Services: Medical and dental sick call, medical emergencies, medications, dental care, eyeglasses, physical examinations, chronic care, and preventive health care services are available to inmates. While emergency medical care is available 24 hours a day, inmates must submit a triage form to be evaluated for routine care needs. Psychology Services: All inmates at FCI Ray Brook are screened by Psychology Services staff during the institution’s Admission and Orientation Program. Screening may include an individual interview. Psychologists are available for individual and/or group psychotherapy. Inmates interested in psychology services should submit an “Inmate Request to a Staff” (“Cop-Out”) to Psychology Services requesting placement in a particular program or class. Mental health services are offered for those suffering from behavioral or emotional problems. Residential Drug Abuse Program (RDAP): FCI Ray Brook does not house a Residential Drug Abuse Program (RDAP), but referrals can be made to institutions which do provide RDAP. A Drug Abuse Education Course, the Non-Residential Drug Abuse Treatment Program (NR-DAP), Alcoholics Anonymous (AA), and Narcotics Anonymous (NA) are available. Education Services: FCI Ray Brook provides literacy, GED, and English-as-a-Second Language (ESL) programs. Parenting classes and Adult Continuing Education (ACE) classes are also available. FCI Ray Brook offers a Literacy Volunteers of America program. High school diplomas and post-secondary programs are available through paid correspondence programs. Advanced Occupational Education: FCI Ray Brook offers advanced occupational education in Associate Certified Electronics, Business Math 1 & 2, Business Word 1 & 2, Credentialed Alcohol Substance Abuse Counselor, Customer Service Specialist, Introduction to Customer Service Specialist, and Office Manager/Administrative Services. Vocational Training: FCI Ray Brook does not offer any vocational training aside from the advanced occupational education and apprenticeship programs. Apprenticeship: FCI Ray Brook offers apprenticeships in Building Maintenance Repair, Career Development Technician, Education and Training, Housekeeping, and Recreation Assistant. Library Services: FCI Ray Brook offers both a law and leisure library. The law library is located in the Education Department and contains a variety of legal reference materials for use in preparing legal papers. Reference materials include the United States Code Annotated, Federal Reporter, Supreme Court Reporter, Bureau of Prisons program statements, institution supplements, indexes, and other legal materials. A leisure library is available in the Education Department. Inmates may check out books, magazines, reference materials, and newspapers. UNICOR: The FCI Ray Brook UNICOR facility produces clothing and textiles. Commissary: Inmates are allowed to spend $360.00 monthly in the commissary on their assigned shopping days. In addition, inmates are authorized to have three (3) books of stamps in their possession. Clothing, shoes, over-the-counter medications, food, drink mixes, and other items are available for purchase. Spending limits on certain items may apply. Recreation Services: Recreation programs at FCI Ray Brook include indoor activities. Intramural team sports, such as softball, soccer, basketball, and volleyball are available. The leisure art/craft programs include acrylic painting, pencil art, ceramic craft, oil painting, crochet/knitting, and beadwork. In addition to these programs, a housing unit art/hobbycraft program offers crochet/knitting, pencil art, beading, and paper art.